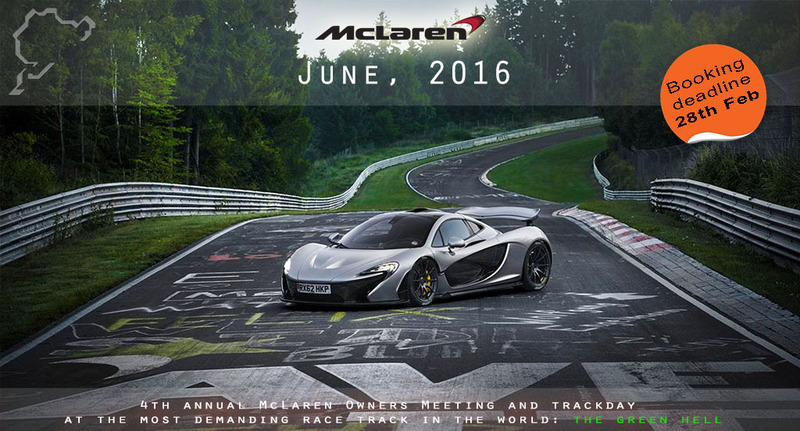 I'm delighted to announce the 4th annual McLaren Owners Meeting and Trackday at the famous Nuerburgring Nordschleife. The event is taking place in June 2016. Further information for owners can be found in the closed Owners Lounge of the forum. Send me a PM if you are an owner and interrested in participating. How do I get to see the owners lounge ? Send Boxer here a pm to put you on owner status. I think it's all booked up. There are only a certain number of spots open for this run. @McDc am I right on that? @louq, as Jamie and Andy pointed out, this years event is completely sold out, sorry. Would have been great to have you with us in your 570S. The event is normally announced mid January with a booking deadline end of February. Hope to see you on the list next year ! Nurburgring Track Day - Local Owner! I live in Adenau am Nurburgring and have a 12C (along with other track cars) and also an apartment for rent in my own home if it is available for your track day (can not see any published dates!). If guys on the track day need local help then I am pretty up to speed on all the local garages and services who can help.